Markets had a thoroughly disappointing session on Monday as after staying very briefly in the green in the morning; it slipped and remained in a falling trajectory all throughout the day. The benchmark Index NIFTY ended the day losing 79.70 points or 0.75%. The broader Markets saw extremely dismal performance with Midcap and Small Cap universe losing between 1.80% to 2.46%. Poor sector performance was seen in Pharma, Auto, Media, Metal and Realty as they saw losses anywhere from 1.6% to 3.3%. As we approach Tuesday, the level of 10538 remains extremely important to watch for. This level is the 100-DMA of the Markets. The NIFTY has ended a notch below this level but still remains within its filter. Tuesday is likely to see a quiet opening and we might see Markets attempting to find some stability at current levels. In any case, for NIFTY to stabilize, moving past 10538 and sustaining above that will be of immense importance for the Markets. 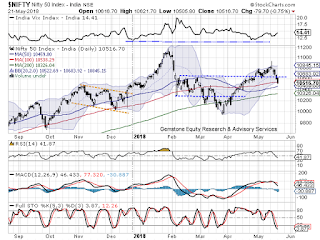 The levels of 10538 and 10590 will act as immediate resistance area for the Markets. Supports come in at 10490 and 10450 zones. 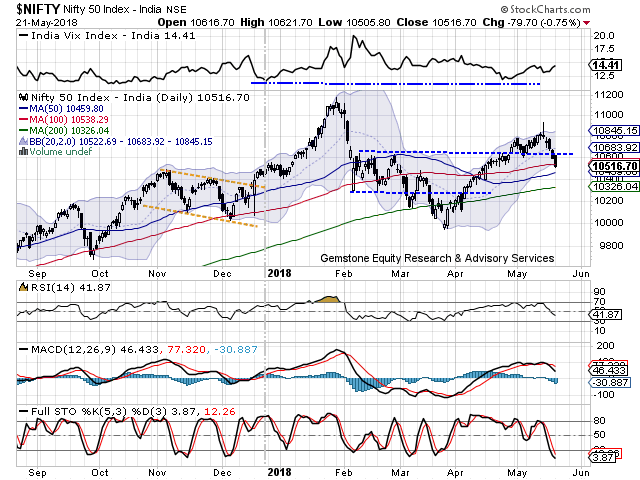 The Relative Strength Index – RSI on the Daily Chart is 41.8687 and it has marked a fresh 14-period low which is bearish. RSI, however, does not show any divergence against the price. Daily MACD stays bearish while trading below its signal line. Apart from a black body that occurred, no significant formations were seen on the Candles. Pattern analysis shows that NIFTY which had broken above 10550-10600 zone which represent multiple resistance area earlier, not only suffered a full throwback but dipped below the breakout level and in the process failing the breakout. Overall, with the NIFTY dipping below 10550-10600 zones, it now once again trades inside the earlier broad trading zone of 10310-10600. However, it currently flirts with its 100-DMA. It would be important to see if this level is held as support at Close levels. NIFTY presently stays within the filter of this support and for it to stabilize a move above 10538 and sustenance above this level will be important. We recommend keeping overall exposures light in the present scenario. Focus should be now to start reducing the shorts positions if any as the NIFTY is nearly oversold on some of the oscillators. Quality purchases may be made in modest quantities. Cautious view is advised for the day. Unwinding was seen on counters like HINDALCO, ITC, RNAVAL, PTC, NHPC, ADANI POWER, HDFC BANK, FEDERAL BANK, BAJAJ FINANCE, AXISBANK, VOLTAS and NCC.